When you’re driving along in your car, do you ever wish the music sounded better? Do you find yourself constantly fiddling with the sound settings on your dashboard? If so, you may be interested in investing a set of the best 6×9 speakers. Speakers come in many different sizes and forms. When installed in your vehicle, the speakers provide increased bass to round out and supplement your listening experience. But choosing a system can be complicated, especially if you’re unfamiliar with the terms and specs associated with speakers. We’ve written reviews of the top ten best 6×9 speakers to help you make your decision. Refer to our Buyer’s Guide to better understand what specifications will be most relevant in your search for the right one. Read our FAQ to make the most informed choice about which model will work best for you! 1. What specifications should I understand when researching? 2. What is a Three-Way and Two-Way Speaker? 3. What are “Coaxial” Speakers? The Kicker 41DSC6934 D-Series has a maximum power of 360 watts and an RMS power of 90 watts each. With a drop-in coaxial upgrade, these 4-ohm speakers have the flexibility to fit in the doors of any vehicle, giving you a significant improvement over the factory-level sound. The three-way speakers come in a set of four, with little to no tweeter protrusion and thin-profile woofers that avoid obstructing mechanisms for car windows. Because the woofers have high-sensitivity motor structures, they deliver increased volume output. They are also able to handle add-on amps. However, customers have indicated that the parts can sometimes arrive broken after shipment. 4-ohm speakers with an RMS power of 90 watts each. The Kicker 41DSC6934 D-Series 6×9″ would be a great choice if you’re looking for an easy installation. 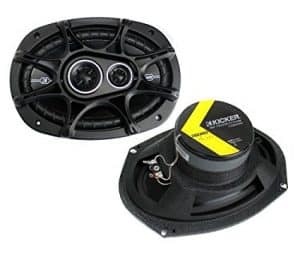 They’re designed to fit in the doors of any vehicle, and with thin-profile woofers and little tweeter protrusion, these speakers from Kicker promise to fit well in any car. With an RMS power of 90 watts per each and an impedance of 4 ohms, these would provide a great midrange level of sound. The JL Audio C2-690tx has a maximum power of 125 watts and an RMS power of 70 watts each. These three-way speakers come in a set of two, with a sensitivity rating of 93 dB. They feature silk dome tweeters and a great silver-and-black design that would look exceptional in any car door. However, several consumers report poor sound quality from the JL Audio C2-690tx, possibly due to the low power-handling RMS measurement of 70 watts. RMS power of 70 watts each. The JL Audio C2-690tx boast a great-looking design with black and silver exteriors. With the low power handling measurements, it’s likely that the JL Audio speakers might not manage well in high-powered sound systems. But if you’re interested in a great-looking set of speakers more than the quality of the sound, these might be worth investigating. The Kicker 40CS6934 has a maximum power rating of 450 watts and an RMS power of 150 watts each. They come in a set of four with a coaxial setup that helps save space while lowering the cost to you. These speakers deliver an ultra-clean bass using magnets and a heavy-duty motor not found in stock speakers. Lightweight tweeters enhance the clarity and volume of the sound. However, without an advertised impedance rating, it’s hard to know how easily electricity will flow through the speakers. RMS power of 150 watts each. 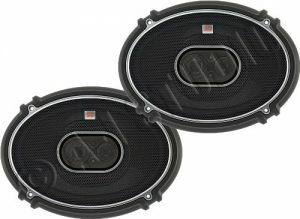 The Kicker 40CS6934 would be a great choice for anyone focused on installing speakers that deliver a solid bass sound. With an impressive set of power handling measurements, these speakers from Kicker promise to manage well in high-powered sound systems. These Kicker speakers prioritize the quality of the sound using lightweight tweeters and a full-range, coaxial setup. The Infinity Kappa 693.11I has a maximum power of 330 watts and an RMS power of 110 watts each. They come in a set of two, with chrome inserts on the grille to match modern car interiors. These 2-ohm speakers are high-sensitivity with significant fidelity improvements from factory-installed systems. Though these speakers aren’t ideal for loud, punchy sound, they do an excellent job of balancing music and producing a clear, crisp sound. However, some consumers report that these Infinity Kappa 693.11I break quickly and easily. Some speakers broke after as little as two weeks; others broke after two months. 2-ohm with an RMS power of 110 watts each. Chrome inserts on the grilles. May break after a few weeks or months of use. The Infinity Kappa 693.11I has an impressive RMS power of 110 watts each and an impedance rating of 2 ohms. Though some consumers report that they break quickly and easily, they excel at balancing music and delivering crisp sound. If you’re looking for loud, punchy sound, another speaker set may be preferable. 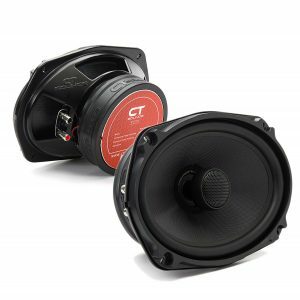 The CT Sounds Meso has a maximum power of 320 watts and an RMS power of 160 watts each. They come in a set of two, with 25mm silk dome tweeters that produce high-quality sounds at high frequencies. These 4-ohm speakers from CT Sounds allow for next to no distortion when playing tracks full of heavy bass, and the coaxial setup helps save space while lowering the price you pay. However, some consumers report that the sounds produced by the tweeters overpower the mid-range frequencies. 4-ohm with RMS power of 160 watts each. The CT Sounds Meso come with silk dome tweeters that produce the highest quality sounds at high frequencies and a 4-ohm impedance rating that allows for little distortion at lower frequencies. With an RMS power of 160 watts and a peak power of 320 watts each, this set of two-way speakers promises to hold up in a high-powered sound system. The Infinity Reference X REF-9603ix has a maximum power of 300 watts and an RMS power of 100 watts each. They come in a set of two, with woofer cone technology that maximizes the surface area of the cone. These 3-ohm speakers from Infinity have a sensitivity rating of 94 dB and work with all amplifiers rated for 4-ohm operation. However, some consumers report that the bass sounds rather weak and overpowered by a bright, sharp treble—suggesting that the tweeters may need to be balanced with additional woofers. 3-ohm with an RMS power of 100 watts each. The Infinity Reference X REF-9603ix may not produce the best sounding bass, but their 3-ohm impedance rating and protective speaker grills would help this system last long in a high-powered system. These speakers from Infinity will work with all amplifiers rated for 4-ohm operation and have a sensitivity rating of 94 dB. 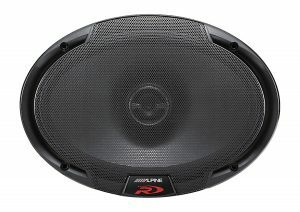 The Alpine SPR-69 has a maximum power of 300 watts and an RMS power of 100 watts each. They come in a set of two with a coaxial setup that helps save space while lowering the cost to you. 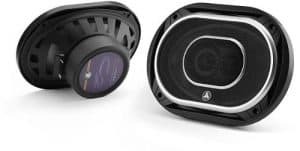 These speakers from Alpine have a sensitivity rating of 90 dB and a new style for the grille that offers full woofer protection. However, some consumers report that the speakers struggle with bass, especially at high volumes. RMS power of 100 watts each. The Alpine SPR-69 is one of the lower-priced, midrange sets of speakers reviewed here. The two-way coaxial setup saves space and money, passing those savings to consumers. With a sensitivity rating of 90 dB and an RMS power of 100 watts each, these Alpine speakers won’t provide the best or the worst sound—and you won’t pay the best or the worst price. The JBL GTO938 has a maximum power of 300 watts and an RMS power of 100 watts each. They come in a set of two, with a sensitivity rating of 94 dB. These 2-ohm speakers from JBL use a state-of-the-art woofer cone to increase bass output and efficiency. However, some consumers reported that the tweeters broke after a single use or arrived damaged. 2-ohm with an RMS power of 100 watts each. Sensitivity rating of 94 dB. The JBL GTO938 use a state-of-the-art woofer cone to optimize bass output for maximum efficiency. Though the tweeters have presented problems for some consumers, the three-way component speakers are likely to deliver solid sound, based on the sensitivity rating of 94 dB. With an impressive impedance of only 2 ohms, these JBL speakers would be a great choice for anyone looking for clean, clear sound. The Hertz Audio HCX690 has a maximum power of 260 watts and an RMS power of 130 watts each. They come in a set of two, with a sensitivity rating of 94 dB and a coaxial setup that helps save space while lowering the cost to you. These 4-ohm speakers from Hertz produce a clear, loud, powerful sound with impressive bass. However, compared to some others, these aren’t particularly well designed. If you’re looking for something visually pleasing, you might prefer another option. 4-ohm with an RMS power of 130 watts each. The Audio HCX690 from Hertz produce a clear and powerful sound with impressive bass. 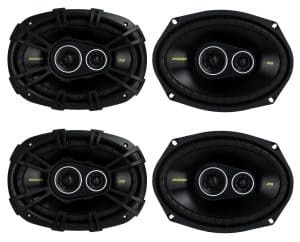 Though they aren’t as visually appealing as some other models, their RMS power of 130 watts each and sensitivity rating of 94 dB make these a smart choice for anyone installing 6×9 speakers for the first time. The Memphis PRX6903 have a maximum power of 120 watts and an RMS power of 60 watts each. They come in a set of two with a sensitive, polypropylene cone and a coaxial setup that helps save space while lowering the cost to you. They are easy to install and deliver a solid sound. Their sensitivity rating is 90 dB. RMS power of 60 watts each. The Memphis PRX6903 are easy to install and deliver crisp, clear sound. With a sensitivity rating of 90 dB and an RMS power of 60 watts each, these speakers may not thrive in a high-powered system, but the three-way coaxial setup promises to deliver great sound on a budget. With a working audio system in your vehicle, you can listen to your favorite music. You can listen to updates on current events. You can even take a tour of the Everglades through the National Park Service. The quality of your car’s audio system matters, and sometimes, you want an upgrade from the factory-installed system. Aftermarket 6×9 speakers are a great way for first-time audiophiles to try out speaker upgrades. Just make sure that your new sets comply with local noise regulations. Some areas have restrictions on how loud your speakers can be. Whether you’re looking for the best 6×9 speakers for bass or just trying to understand some basic terminologies, this buyer’s guide is a great place to start. All speakers require a power source from a receiver or amp. The first two measurements of power-handling will help you determine whether the speakers will match well with your existing system. Note the chief difference between RMS power and peak power. RMS power measures how much the speaker can handle continuously. Peak power measures how much the speaker can handle in one short burst. For this reason, RMS power is a more useful measurement when determining speaker suitability. Fun fact: RMS stands for “Root Mean Square,” the statistical measurement that generates RMS power measurements. Impedance also measures the amount of power that the speakers can handle. The lower the impedance measurement, the more easily the electricity—the signal or music—flows through the speaker. RMS and peak power ratings gauge how much electricity a speaker can handle. Impedance measures how much the speaker will resist that power. Sensitivity measures how well the speaker will turn that power into sound. You’re unlikely to find any specific measurements of sound quality, as objectively gauging sound quality presents certain complications. The “driver” is the part of the speaker that produces the sound. Three-way speakers have three drivers; two-way speakers have two drivers. In two-way speakers, one of the drivers is for high frequencies, and one is for mid to low frequencies. They usually include a tweeter and a midrange driver. In three-way speakers, the three drivers support a set range of frequencies. This setup is easier overall for the speakers than the two-way setup. They include a tweeter, a woofer, and a midrange driver. If you’re looking for the best possible sound, a three-way set might be your best choice. If you’re looking for better sound on a budget, a two-way set should be fine. 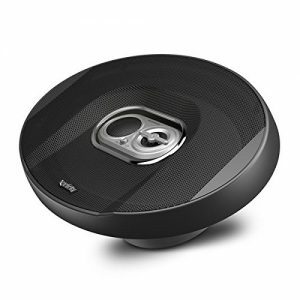 Three-way speakers produce better quality bass, due to the inclusion of a woofer. Also known as “full range” speakers, reproduce a larger range of audio frequencies from one unit. The drivers in them are combined, saving money and space. They are usually two-way speakers, with a tweeter mounted on top of a woofer. Three-way coaxial speakers contain a woofer, a midrange, and a tweeter. Compared to component speakers, full range or coaxial are less expensive and easier to install. 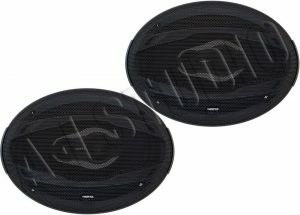 Component speakers provide better sound quality and more opportunities for customization. In a component speaker system, the woofers and the tweeters come separately with external crossovers. Because the tweeters and woofers are separated, you can mount them in ideal locations for the best sound imaging. The Kicker 41DSC6934 D-Series come in a set of four, with little to no tweeter protrusion and thin-profile woofers that avoid obstructing mechanisms for car windows. With a drop-in coaxial upgrade, these speakers have the flexibility to fit in the doors of any vehicle, giving you a significant improvement over the factory-level sound. The JL Audio C2-690tx boast a great-looking design with black and silver exteriors. The rounded features of the facade draw the eye to the center of the speaker, beckoning onlookers deeper into the source of the sound. 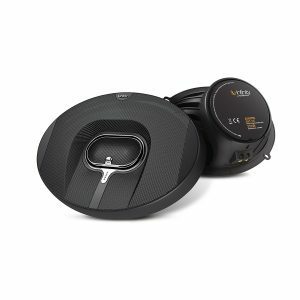 The C2-690tx from JL Audio would look amazing installed in any car door. The Kicker 40CS6934 is a three-way, coaxial speaker that delivers an ultra-clean bass at high volumes. With an impressive RMS power of 150 watts and peak power of 450 watts, this set of four can handle a lot of power while filtering a delightful, car-rattling sound. Information about car audio systems tends to confuse the novice audiophile. But now that we’ve defined a few terms and outlined some of the better speakers available, you should feel more comfortable deciding and tackling an installation. Pay attention to the power handling measurements, the sensitivity, the impedance, and the tweeter/woofer setup. If you’re interested in heavy bass, you’ll want something with low impedance, high power handling measurements, and high sensitivity. In all cases, make sure that the ones you buy can handle the electricity they’ll receive from your car.